LNWC's Island Habitat program is being modeled after NCWF's and Duke Power's sponsored Island Habitat program™ in the rapidly developing Catawba River basin area. 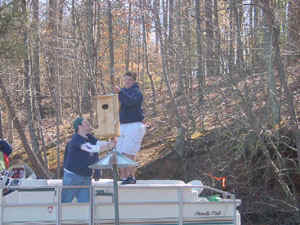 The goal is simply to enhance island habitats for wildlife by cleaning them of refuse and by erecting nesting boxes. Increased education for participants and the public regarding wildlife habitat stewardship is another positive component of this program. The Catawba River courses through North Carolina’s western foothills, one of the most rapidly developing areas of the state. Just recently NCWF partnered with Duke Power to bring attention to critical wildlife habitat along the Catawba through the new Island Habitat Program™. With pilot projects, like LNWC's Island Adoption program, throughout the Catawba River valley, the island program is considered a model for other waterways across the state. Improper use of islands and the surrounding waters by the boating public frequently results in litter that impacts aesthetics, and which is actually a hazard to many wildlife species. Ducks and geese get six-pack rings around their necks. Fish are trapped in plastic bags. 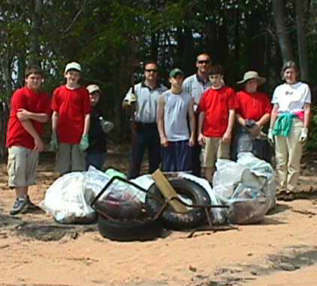 The goal of the Island Habitat Program is to provide partnerships that will help keep Lake Norman islands clean of litter, serve as an educational tool for raising public awareness of the proper disposal of litter on public waters and lands, and work toward protecting and enhancing wildlife habitats. The program seeks fishing clubs, duck hunting groups, conservation organizations, and other wildlife enthusiasts to “adopt” an island. Participating groups agree to periodically clean up the litter from their island while providing data on wildlife species that inhabit their island and note positive and negative habitat characteristics and changes. In addition, shoreline stabilization with valuable wildlife plantings such as button bush Cephalanthus occidentalis . 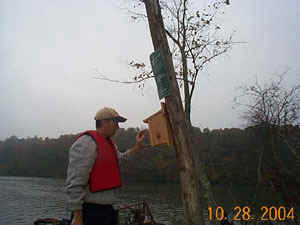 Adopting groups build or receive nesting boxes for wood ducks, blue birds, flycatchers, owls, bats, prothonotary warblers, etc to erect on the island as well as a handsome sign that denotes their participation in the program.